Advances in 3D printing have brought its price down to where it is now a common manufacturing process for small organizations and individuals. But if you are like us and need custom metal parts old-school subtractive processes, like CNC milling, are still the only practical solution. CNC machines costing tens of thousands of dollars automate many of the production steps for you. Our setup, based on a Taig micro-mill, cost around $4,000 complete, including controls, enclosure, coolant system, and tooling. (click here to see our mill's specs and setup instructions) We are thrilled with our mill because it is precise and nearly indestructible, but it lacks many of the automated bells and whistles that many machinists take for granted. Consequently, it’s a great learning tool and one we thought we could use to demonstrate milling fundamentals to those considering adding CNC milling to their tool set. Unlike 3D printing, milling is not a single, push-of-a-button process. 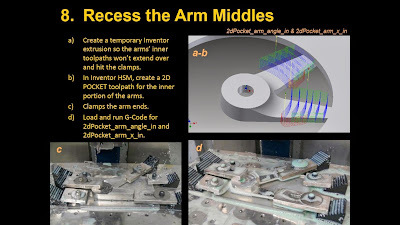 The following are the steps it took us to mill a moderately complex aluminum part for our competition robot using Autodesk Inventor HSM. We chose a part that included some 3D (sloping) features and needed to be flipped over mid-way through the process to shape both the front and back. Moving (in this case flipping) the piece requires the intermediate step of creating a part holder, called a fixture, that maintains dimensional alignment between operations.